WILSON'S Thrush is never seen or heard in Louisiana during spring, and a few only pass through the lower portions of that State in autumn. I suppose its migration from the further south is along the declivities of the range of the Alleghany Mountains, at least for some distance, and it probably takes place under night. It reaches the mountainous districts of Pennsylvania early in the month of May, but few if any breed there. In the upper parts of the State of New York, they become more plentiful, and there some undoubtedly spend the summer; but from Massachusetts eastward to Labrador, they become more and more abundant. On the 20th of July, while in the latter country, I saw the young of this species following their mother. They were there almost full grown, and could fly a hundred yards or so at a time. By the 12th of August none were seen, although during my stay they were as common as any other birds. In the latter part of the same month, I met with those which had bred at Newfoundland, on their return to the south, and followed them into Massachusetts. At Labrador, as well as in the latter State, the Tawny Thrush retains its retired habits, and seeks refuge in the concealment of dark shady woods, near brooks or moist grounds. There, in a low bush, or on the ground beneath it, this bird builds its nest, which is large, composed externally of dry leaves, mosses, and the stalks of grasses, and lined with finer grasses, and delicate fibrous portions of different kinds of mosses, without, any mud or clay. The eggs, which are deposited early in June, are from four to six, and resemble those of the Cat-bird in colour and shape, but are of smaller size. They raise only one brood in the season. The parents, ever extremely shy, shew no desire to assist their young, or defend their nest from intruders, but remain during your visit at some distance, uttering a mournful and angry quake, somewhat resembling that of the Cat-bird on such occasions. The Cow Bunting not unfrequently deposits its egg in the nest of this Thrush, where it is hatched, and the young brought up with all imaginable care. In the neighbourhood of the city of Boston, some of these birds, according to my learned friend NUTTALL, breed sometimes in the gardens, and he has known of a nest placed in a gooseberry bush. A full fledged young one that was caught and placed in a cage, retained the unsocial and silent timidity peculiar to the species. The males are obstinate in their quarrels, and fight with great fierceness in maintaining their right to the ground which they have appropriated to themselves. The song of this species, although resembling that of the Wood Thrush in a great degree, is less powerful, and is composed of continued trills repeated with different variations, enunciated with great delicacy and mellowness, so as to be extremely pleasing to one listening to them in the dark solitudes where the sylvan songster resides. It now and then tunes its throat in the calm of evening, and is heard sometimes until after the day has closed. It searches for food even at those hours, and feeds principally on coleopterous insects. In Labrador it also picks the tender blossoms of several dwarf plants, and feeds on berries. Its time is, for the most part, spent on the ground, where it moves with singular agility by leaps, stopping instantaneously and standing erect for a few moments, as if apprehending danger, but immediately renewing its course. The specimen presented in the plate was procured and drawn in the State of Maine. All the Thrushes examined, as well as the Shrikes, Warblers, Flycatchers, Swallows, in short all the land birds, have a pair of muscles proceeding from the sides of the thyroid cartilage, to be inserted into some part of the furcula. In all the Thrushes, the right lobe of the liver is larger than the left, under which it passes in the form of a thin expanded lobe; and there is no gallbladder. TAWNY THRUSH, Turdus mustelinus, Wils. Amer. Orn., vol. v. p. 98. TURDUS WILSONII, Bonap. Syn., p. 76. MERULA MINOR (Swainson), Little Tawny Thrush, Swains. and Rich. F. Bor. Amer., vol. ii. p. 179, Plate 36. The description and figure clearly refer to the present species. 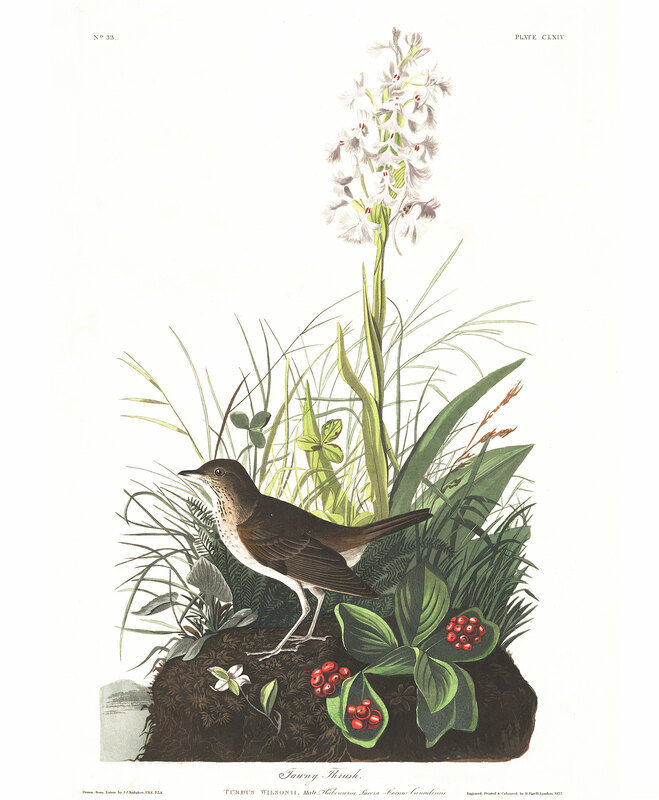 WILSON'S THRUSH or VEERY, Turdus Wilsonii, Nutt. Man., vol. i. p. 349. TAWNY THRUSH, Turdus Wilsonii, Aud. Orn. Biog., vol. ii. p. 362; vol. v.p. 446. Wings with the third quill largest, the fourth scarcely shorter, and slightly exceeding the second. Upper parts uniform light reddish-brown, a little deeper on the head; quill and tail-coverts light olive-brown, the outer webs of the former like the back; lower parts greyish-white, the sides and lower part of the neck, and a small portion of the breast tinged with pale yellowish-brown, and marked with small faint and undecided triangular brown spots. Female an inch less in length than the male, but otherwise similar.